It was a smart move. Originally titled In The Deep and set for a straight-to-DVD release in August, at almost the eleventh hour, Entertainment Studios has given its newly acquired shark/horror adventure a theatrical release. 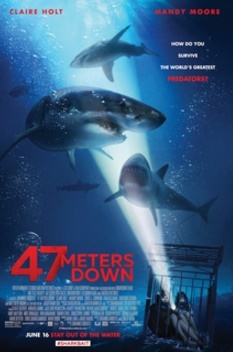 Now called 47 Meters Down, summer audiences can see on the big screen what they might have missed had it joined the VOD market too early. 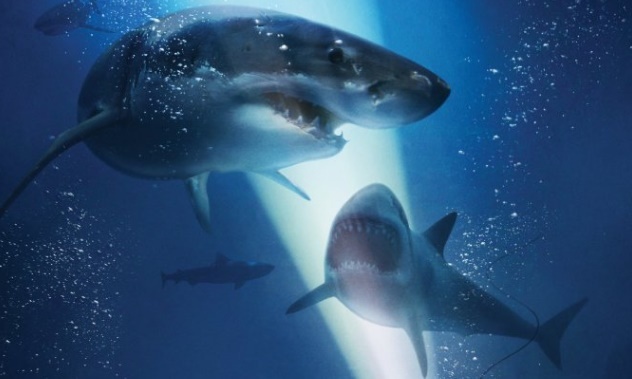 The film is by no means one of the great shark attack sea-going yarns, and it won’t set the box-office on fire, but it should initially have a tidy return on its small investment. Plus, shot widescreen with good production values, seen on a wide theatrical canvass, the film looks great. From a business perspective, definitely a smart move. The setup is simple. Lisa (Mandy Moore) and Kate (Claire Holt) are sisters on vacation in Mexico. Lisa is there to get away from a relationship gone wrong. Kate is there to have fun and make sure her sister has fun, too. To make things exciting, the girls decide to leave the safety of the hotel swimming pool and head for the ocean. A couple of local boys with a boat have enticed them to see underwater life at close-view. Maybe even some sharks. All the girls have to do is put on scuba gear and step into a cage that will lower them no more than five meters into the clear blue ocean. “It’s like going to the zoo, except you’re in the cage,” one of the boys tell them. Once on board the rinky-dink looking rust-bucket of a boat, a grizzled looking Captain Taylor (Matthew Modine) tells the girls, “Trust me, once you’re down there, you’re not gonna want to come up.” And even though the cage looks almost as rusty as the boat itself, down they go. But then, so does the hoist. After a few minutes of enjoying sights undersea, including two twenty foot sharks attracted by the illegal throwing of chum circling around the cage, it happens; the cable gives, the hoist snaps, and the girls speedily descend to the seafloor below, forty-seven meters down. Now too far out of radio contact with the guys on the boat above, trapped inside the cage with coiled cable and a large wench blocking the opening, not to mention some hungry looking great whites trying to get their snouts through the bars, the girls’ chances of survival are slim to none. Plus, their oxygen is running out. Running at only a brisk eighty-nine minutes including credits, with this setup, the film is as long as it needs to be. After some unnecessary business concerning Lisa and the guy back home who left her, the film swiftly creates the situation and gets the girls in peril as soon as it can. The rest is told in real time. The problem with this kind of situation will always be the dialog. Despite the low-rent look of Captain Taylor’s boat and his equipment, not to mention the low-rent look of the captain himself, the scuba-diving gear and the radio-wired masks he loans the divers are first class, which is fortunate for not only the girls to talk to each with the clarity of an HD 4G signal, but fortunate for us; we can hear everything they say, even if radio communications with those above is gone. That means that listening to two terrified young women in a nightmare situation has it fair share of stoopid-sounding dialog. And preview audiences laughed, which is a shame. 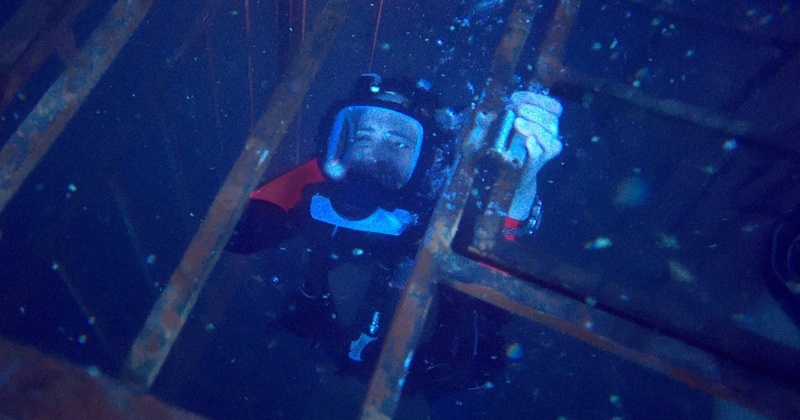 They laughed when Kate declares, “I’m really lost and I’m freaking out right now.” They also laughed when Lisa says, “I’m so deep I can’t even see what’s below me.” Plus, when radio contact with the captain above is briefly made, and the captain says slowly, deliberately, “I need you to get back in the cage,” the audience laughed even more. And sadly, it wasn’t the nervous laughter that helps break a tense moment, it was more of an, oh, come on, laugh; the kind that comes when you find something exhausting for its stupidity. In reality, one of the girls declaring, “That shark almost got me!” isn’t funny at all, and neither was most of the other dialog. And, be honest, if you or I were in that same situation, you can bet that our panicked language would be considerably more colorful, filled with obvious statements, and sounding hilarious to those relaxed and seated in the comfort of a movie-theater seat, but for some reason, hearing the girls talk of their fright on film through scuba masks causes laughter, and sadly, it works against the movie. However, the situations created within those eighty-nine minutes are genuinely tense, and there will be moments that’ll have you adjusting uncomfortably in your seat. (For the amusement of British audiences, all the underwater scenes were filmed in a tank in Basildon, Essex, doubling for off-shore Mexico.) Plus, it really will elicit a shriek or two. You may even jump, causing popcorn to leap from its bag. With a film such as this, with sharks as big as these, and a situation that looks impossible, it does exactly what the poster promises; you can’t expect more. And it never bores. So, go ahead; enjoy. And when you laugh when someone shrieks something obvious, try to imagine what you would be saying in that same position. It’s no Jaws, but it is fun.